DALI Spektor 6 review | What Hi-Fi? When Dali first announced a new budget range of speakers, we immediately wondered if this was the death knell for the much-admired Zensor series. 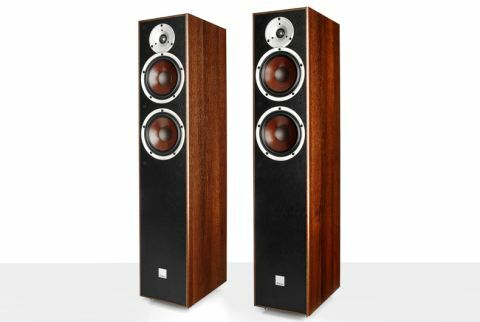 But the Spektor range isn’t here to replace the long-standing Zensors; they offer a new, slightly lower-priced entry point to the Danish loudspeaker company’s range. We’ve got the flagship and only floorstanders of the range here, and expectations are high: the £500 Spektor 6s promise to offer big wallops of exciting sound for an affordable price. One look at the wood-pulp drivers and the mix of cabinet textures (vinyl wrap and leather effect) and you won’t mistake these Spektors for anything but a Dali. These are two-way speakers with the 25mm soft-dome tweeter joined by two 16.5cm mid/bass units. Around the back you’ll find two bass reflex ports, which help to augment the floorstanders’ low frequency output. The build quality is good rather than great. While these speakers don’t quite have the luxury feel of rivals such as the Q Acoustics 3050s, they remain solid and smartly finished. There are two vinyl finish options - black ash and classic walnut. Since they’re positioned as entry-level floorstanders, the materials used are a step down from the Zensors. The wood-fibre cones aren’t the same ones used in the Zensors, for instance, but they have the same inherent resonance-reducing properties. Just because Dali has to use more cost-effective materials doesn’t mean it’s ignored one of speaker company’s core principles: wide dispersion. It means that the Spektors – just like other Dali speakers – should be placed straight on, not toed in. Their dispersion characteristics make for a broad sweet spot, which means you can get the full blast of the 6’s sound across a wider range of listening positions. Sure enough, the most prominent feature of the Spektor 6s is how big and effortless they sound. The floorstanders easily fill a room with their large-scale, open sound. They can go pretty loud, too. There’s plenty of body to the presentation. It’s upfront, with a bouncy low end that keeps us tapping along to The White Stripes’ brooding bassline in Seven Nation Army. The guitars crash and whine with crunchy textures, and the Spektors handle the changing dynamics with plenty of gusto. And unlike some other Dalis we’ve heard, the top end does a better job of blending in with the rest of the frequencies, too. It’s a well-balanced sound. The Spektors have an easy going character that bodes well for any genre, regardless of the recording quality, that you throw at them. This unfussy nature does mean they’re not the most transparent of speakers – you won’t hear the Spektors trying too hard to differentiate the tone between a Tom Waits song and an Of Monsters and Men song. But they’re fun and easy to listen to. The Spektors are neither particularly analytical, nor precision masters; they’re just happy playing music in the most crowd-pleasing way possible. That approach does come with its caveats. We’d like a more substantial and insightful midrange, for instance. Voices can sometimes sound a touch vague, with not enough solidity driving Stevie Nicks’ singing in Rumours – it loses a bit of edge and power because of that. Switch to the Q Acoustics 3050, and you can hear more nuances and better organisation. The beats land more precisely, too, and the speakers handle every rhythmic and dynamic shift with an elegance and maturity that the Dalis can’t quite match. If the Dali Spektor 6s were priced a bit more competitively, we’d happily overlook their shortcomings in light of that big, easy and even-toned performance. The Spektors 6s may not be the budget bargain they sought out to be (and the Zensors have nothing to worry about), but we can imagine many liking – even preferring – their big and cheery character.